Hello all! I didn't mean to take a break from blogging, but it's just so difficult to get good photos at this time of year. Consequently I now have two dresses and a pair of jeans that are unblogged, and have now resorted to photos in the spare room. I mentioned this dress in my last post, and it's (yet another!) shirtdress with a convertible collar. I'd been trying to find a dress pattern with a convertible collar for a while to show as an example, and the other day I realised it was under my nose all the time! 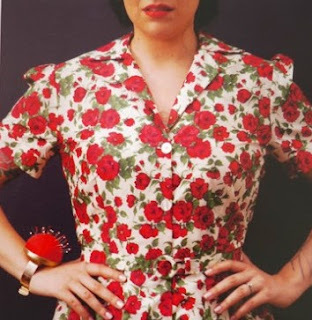 I was looking up something about hand stitching in Gertie's New Book For Better Sewing, and had to have a drool over the red Liberty Carline shirtdress. And what do you know? It has a convertible collar!! Who knew! My dress is made from some Blackwatch Tartan fabric, which I think was from ebay. The skirt is from good old Simplicity 2444. I hadn't made that skirt in ages, and fancied something different than a half circle skirt. I posted about the skirt on Instagram before Christmas, as I was trying a bit of jiggery-pokery with a waist placket. I had seen some photos on the internet of vintage shirtdresses that button to the waist, and instead of having a side zip, they had a seam down the centre front of the skirt with a little placket at the top to allow the skirt to open out a bit. There's a really good example of this on Emmie's blog here. I had this saved on Pinterest, and have just found another example that I'd saved from Sewaholic's blog here. You can also sort of see what I mean on this dress that I also had saved. You can see at the waistband that the placket edge is curving slightly to the left, and the curve extends below the waist seam. Also, it looks like the placket finishes about level with the bottom of the patch pockets. 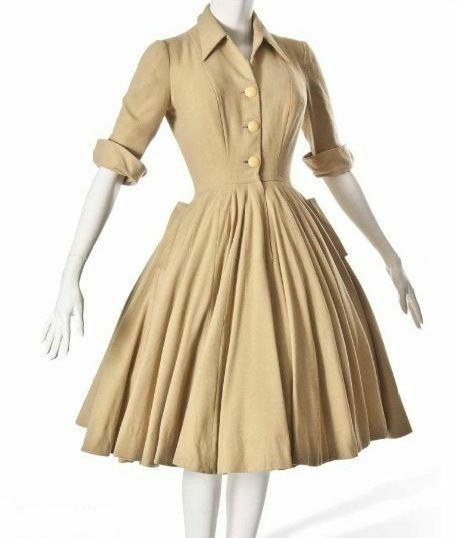 I absolutely love this dress; the Pinterest description says it's a Christian Dior dress from 1947-48, and I fully intend to try and make my own version in green. Anyway, I wanted to replicate the little placket on the skirt centre front, and had a good look at the photos on Emmie's blog. Long story short - it was a disaster, and I ended up putting in a side zip. But, nothing ventured - nothing gained, and maybe I'll try it again using the photos from Sewaholic as a reference. If you follow me on Instagram, you will know that I have been working on a winter coat. It's going really well (yey!! ), and I'm hoping to get it finished in this coming week. Then it will definately get bumped up the blogging queue. Thank you! Isn't the Christian Dior dress gorgeous?! Love your dress. I presume you didn't use The pattern sleeves which I didn't like the puff on. The dIor dress is a dream can't wait to see your version of this. Thank you! I didn't use Gertie's pattern, the bodice and sleeves are self-drafted - which I should have remembered to mention, but didn't! Sorry! Gorgeous dress, I love that style collar. I love this!! Now I want one for myself.... time to take out my Gertie book! Thank you! I googled S1880, and oh my goodness, how have I not seen this pattern before?! It's gorgeous, and has gone straight into the shirtdress inspiration pile. Good luck with yours. I missed seeing this post, your pattern matching is as brilliant as ever! Can't wait to see your coat!